"A classic creamy coleslaw loaded with veggies!" Toss the cabbage, kohlrabi, celery, carrot, and onion together in a large bowl. Whisk the sugar, salt, pepper, celery seed, mayonnaise, and vinegar together in a separate bowl until smooth; pour over the cabbage mixture and stir to coat evenly. Chill in refrigerator 1 hour before serving. Took WAY to long to prepare & taste wasn't worth it. Rather bland. Won't be buying kohlrabi again. Not a fan of raw celery, so I left it out and didn't miss it. Used food processor to grate all veggies quickly. 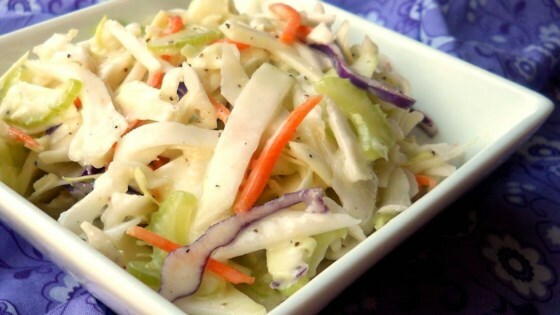 A fabulous slaw! Great recipe to use our CSA recipes. as far as coleslaw goes,this is very good.